The National Museum of Medicine of Ukraine was founded in Kiev in 1973. It is located in the building of the former anatomical theatre of the University of Kiev, constructed in 1853 by architect A. Beretti. The building is considered to be one of the greatest architectural monuments of the 19th century. The founder and the head of the museum is the Doctor of Science in Medicine, the honored Ukrainian scientist Professor O. A. Grando. The museum represents medicine development in Ukraine from the oldest times till the present day. The newest conception of museum arrangement was used as a basis for the new museum. Museum's exposition unifies scientific-methodical materials, documents and exhibits, architectural, art-and-technical and audio-visual means in one impressive complex. As the edition to permanent exhibition there are original interiors with the portrait figures of the well-known scientists and physicians, and dioramas dedicated to the most outstanding events in Ukrainian medicine. The museum's exposition also widely presents the pieces of Ukrainian fine arts dedicated to the medicine. The Central Museum of Medicine of Ukraine is one of the largest medical museums not only in Ukraine but also in Europe. The museum was awarded the State Prize of Ukraine in 1983. The first and second halls represent formation and development of Medicine in Ukraine from antiquity to the early 19th century. The exhibits include historical relics, ancient medical instruments, medical plants which were used in the folk medicine, annalistic sources. The full-scale interior of the ancient old Russian bath-house of the 10th-11th century, which was used not only for hygienic purposes but also for healing is represented there and is of great historical interest. The history of medical science in the 18th early 19th century is also exhibited there. The first medical manuals in Russia written by Ukrainian scientists, a model of Kiev-Mogylyanian Academy, a panorama of medical aid in the Cossack Army are on display. 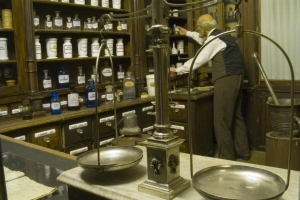 The museum also features some full-scale interiors such as the chemist's shop of the late 18th century. The third and fourth halls introduce the guests of the museum to the development of medical education and medical Science in Ukraine in the 19th and early 20th centuries. You can also see there the original interiors of the first operation room at Medical faculty of the Kiev University. The exposition also represents the development of medical science in different branches of medicine of the 19th century of Ukraine, in particular, in surgery, ophthalmology, gynecology, pathology, bacteriology. The fifth and sixth halls are devoted to public health and development of medical science in the 20th century, to struggle of Ukrainian medical specialists with epidemics in Ukraine in the 20s, after the October revolution, organization of different medical establishments and scientific-research institutes. These halls are also concerned with such tragic subjects as famine in Ukraine of 1932-1833 and repressions of physicians and scientists in 1937. The unique diorama complex shows the fates of medical personal in the World War II. The Chernobyl tragedy is also represented there. Archives of the National Museum of Medicine of Ukraine are the most valuable materials that formed the basis of fundamental works devoted to the history of Ukrainian medicine.